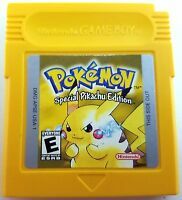 Pokemon Yellow Version Pikachu Game Boy Color Cleaned & Good Save Battery Nice! 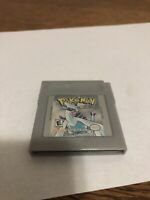 Pokemon Gold Version Nintendo Game Boy Color! ~ NEW SAVE BATTERY! ~ AUTHENTIC! A continuation of Nintendo's successful franchise, Pokémon Gold lets players once again test their skill at becoming the world's greatest Pokémon trainer. For those new to the series, gameplay involves collecting and then fighting creatures called Pokémon while challenging rival trainers for their badges. A secondary goal is to collect the entire roster of 250 Pokémon creatures. Players travel from city to city, talking to people, entering buildings, solving puzzles, finding items, and testing their mettle against trainers looking to humiliate them. Winning a fight involves forming a balanced team of Pokémon that can stand up to the opposition. Success finds the creatures growing in experience, learning new abilities, and possibly evolving into more powerful types. Pokémon Gold features an internal clock that can influence which Pokémon are available depending on the time played. Also included are special events occurring only on certain days of the week. As in previous titles, players may save at any point during their travels and later continue where they left off. In addition to the clock, new features that distinguish Pokémon Gold from earlier versions are dozens of new Pokémon, two new types (Dark and Steel), a new world to explore, and additional evolutions for older Pokémon. Pokémon can also hold items during combat, and the hero now has access to a map, phone, radio, and more, thanks to the wrist-mounted Pokégear accessory. In order to collect all the monsters, players will need to trade with owners of the separate Pokémon Silver. The differences between the two games are negligible, however. Other than the frequency of certain types of Pokémon, both titles play exactly the same and feature identical storylines. Pokémon Gold is backwards compatible with the other versions of the game, meaning players can trade with owners of Pokémon Red, Pokémon Blue, and Pokémon Yellow, but the new creatures are exclusive to the Game Boy Color cartridges and cannot be transferred to older versions. You will receive the exact item in the pictures above. The item we have listed is. Perfect quality, and everything works fine. My inner 7 year old self can finally be happy after the day my teacher stole it and never gave it back. Works just like it used to all those years ago. It's like a trip down memory lane with the best generation of Pokemon to exist. Some might have started on Poke'mon Red or Green, but I started here. The game works perfectly fine and was a lot of fun. I put about 2 hours in right away then saved it and went to bed. When I went to continue playing my only option is New Game and I’ve tried multiple times now. Disappointed, now I have to wait for a replacement battery to arrive. 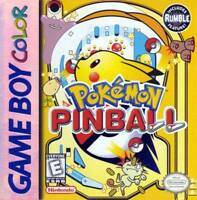 I bought it, because I used to play the gameboy color pokemon games red, yellow, crystal, and silver. I lost my silver game a long time ago, and my crystal couldn't retain memory anymore. I hadn't played gold before. I like it because pokemon has always been a fun game to play, and this time I could get HO-HO. I was also able to benefit from the seller's previous play, with four celebis, and other powerful legendary pokemon. I also got master balls. I dislike that gold doesn't have pokemon that move like in the Crystal version. The only bad thing about this game, is that it freezes randomly, or when I put it down or bump the gameboy.